Mehmet Öztekin, in his late seventies now is known as "Gramophone Baba" and has around 50 gramophones at his shop and 2,000 old records. 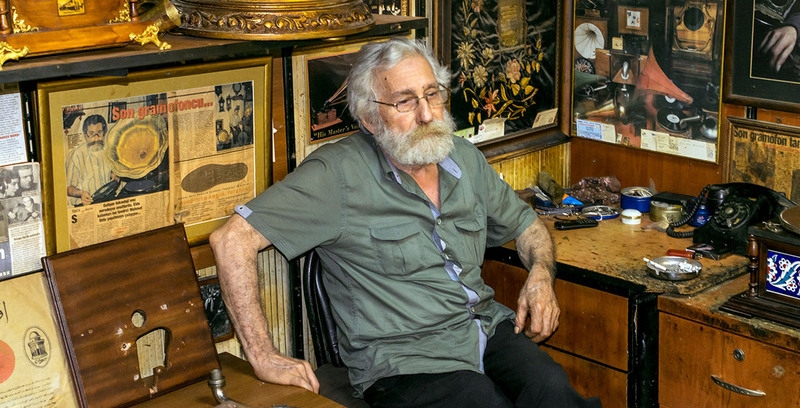 Mr. Öztekin who has been serving gramophone loyalists for 60 years, devoted his life to this profession and caring about his gramophones like his own children, started as an apprentice at age of seven in his father’s repair shop. He has produced more than 9,000 gramophones in 38 years, most of them were sent from different countries around the world. Upon entering his shop one feels like passing through time, packed with old gramophones dating back 1904, plaques in the drawers, newspaper clips with famous artist when gramophones were popular, and pictures with famous people. The master "Papa Gramophone" opens his shop at 8:30 every morning, repairs some and reproduces others. Mehmet Öztekin not only he is a trained repairmen but trains gramophone collectors as well, as a result, more people have started listening to gramophones again instead of getting rid of them as they did in the past and nowdays people are searching for gramophones and gramophone records on the Internet and in junk dealers’ shops. He sells gramophones with varying prices from 800 to 1,000 Turkish liras and one-year guarantee.